Whether they admit it or not, most of those who live on Dauphin Island, Alabama have heard the tales. Some have actually experienced the chilling encounters first hand. It’s just common knowledge among the locals that anyone who ventures out after dark on this historical sliver of sand and charm may cross paths with one of the Island’s resident spirits. You see . . . Dauphin Island is haunted. There is no doubt that the Lighthouse Bakery on Chaumont Avenue is the place for incredible pastries and made to order omelets every morning, but once the sun goes down on the 100-year-old structure, strange things start cooking in the kitchen. Interior of the middle dining room - the room that received the strongest readings from the paranormal investigators during their overnight stay. The investigators captured photos of a dark presence that Mary describes as “really, really weird.” “I don’t know what it was in those pictures, but it had a dark, almost skeletal appearance,” she said. At the far eastern end of Cadillac Avenue is what’s come to be known as the Goat Trees, a large stand of ages-old oaks once used by the Island’s climbing wild goats as a treetop perch to escape marauding alligators that roamed below at night. But, as the story goes, throughout the years the alligators were not the only things to move quietly among the Spanish moss once darkness fell on Dauphin Island. Islander Ursula Prince shared a tale told to her many years ago about young love gone tragically wrong among the Goat Trees. “I was told by one of the real old-timers, that in the years long, long before the Dauphin Island Bridge was built, when the Island was more secluded from the outside world, Islanders would hold their weddings beneath the giant Goat Trees for luck,” she said. Feeling that the site was tainted and no longer appropriate for such happy occasions, no wedding was ever again held beneath the sprawling canopy of the Goat Trees. And, to this day when the moon is full and the gulf breeze blows, the rustling sounds heard coming from Goat Tree Park near Ursula Prince’s home are said to be the spirit of the young bride wandering the grounds and looking for the suitor who left her at the altar. A professional photographer herself, Russell knew that the misty shapes were not the result of temperature change on the lens because she had been shooting outside for some time that evening. She also ruled out reflections and glare from other light sources, and dust on the camera’s internal sensor. So, what were these images that appeared randomly in some frames, but not others? Ghost hunters have taken other photos of an old home on Bienville Boulevard rumored for years to be haunted. Images of what are described by some to be both human and animal-like figures were captured on more than one occasion from the yard and through lower windows of the structure. According to legend two identical houses once sat side by side for more than 110-years on the spirited east end of Dauphin island. Some years back the more structurally sound of the two was moved to its present location to be restored and made “livable”. That’s when the so called “bumps in the night” began. It has been reported that during restoration the owners had trouble keeping contractors on the job as the ghostly residents regularly scared them into leaving. Today the home sits for sale just minutes from its original location with the spirited occupants at the ready to again “welcome” any new buyer or looky-loo. Dauphin Islanders are well aware that their little piece of paradise has a reputation for having a “spirited” nightlife. 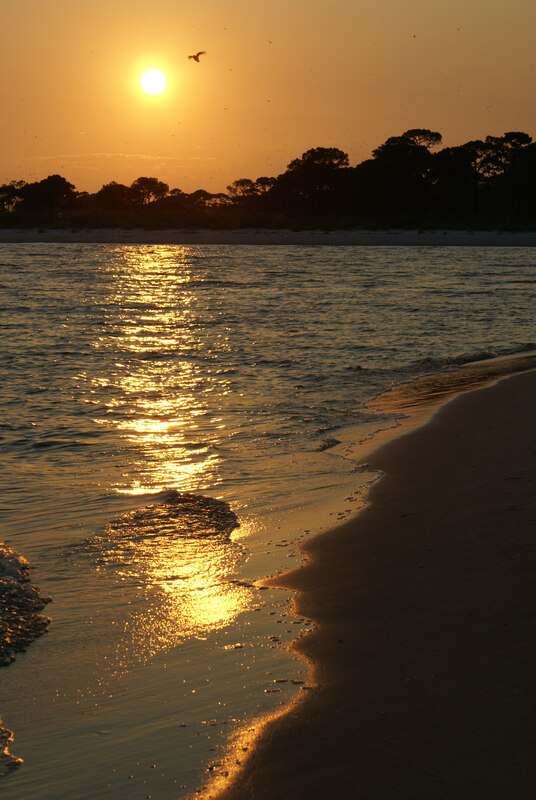 From the Goat Trees, to other rumored haunts such as Cadillac Square Park, and the prehistoric Shell Mounds – a regular site for séances and paranormal investigations, the legendary Dauphin Island is like few other destinations along the Gulf coast whether in this life or the next. Michael Baxter has coordinated brochures, press releases and other projects for businesses and destinations such as Dauphin Island, Alabama, Six Flags AstroWorld, SplashTown Waterpark - Houston, Space Center Houston, and The Port of Galveston. He has also worked with sports network, ESPN. Having been associated with live music for many years, Baxter has developed strong relationships with entertainers and the media sources for promoting them. Texas honky-tonk Country Music performers Miss Leslie & Her Juke-Jointers, Louisiana's first family of Swamp Pop and Rock, L'Angelus, Lone Star singer/songwriter Kyle Hutton, and Cajun rockers Bayou Roux are among the clients to regularly use Michael Baxter for their publicity and promotional needs. Please visit his Web Site Here Now www.baxwrtr.com. Real Ghost tend to seriously haunt or possess only those they know they can control.